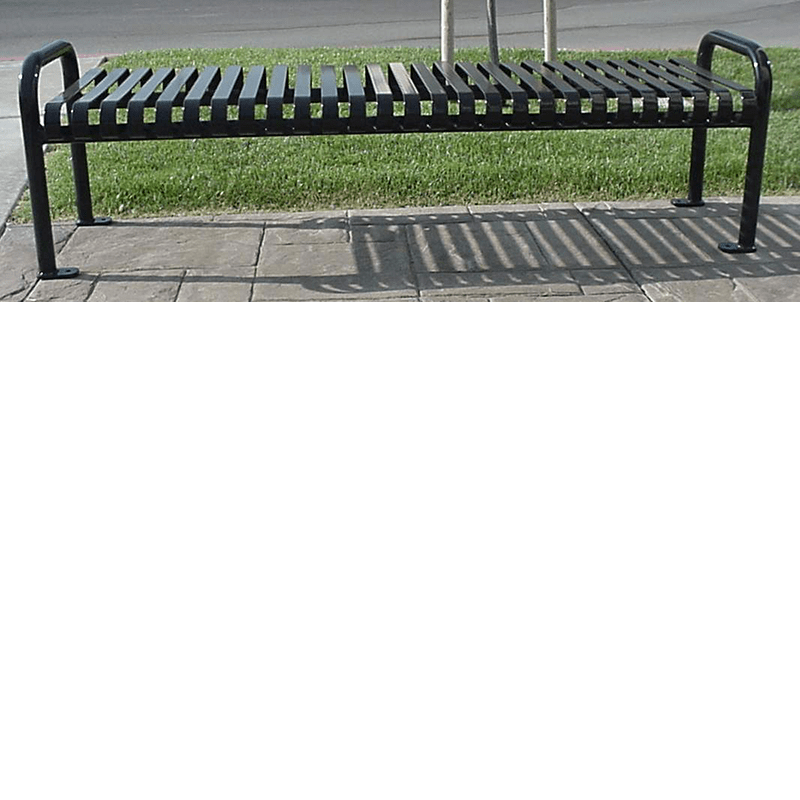 Style for today. 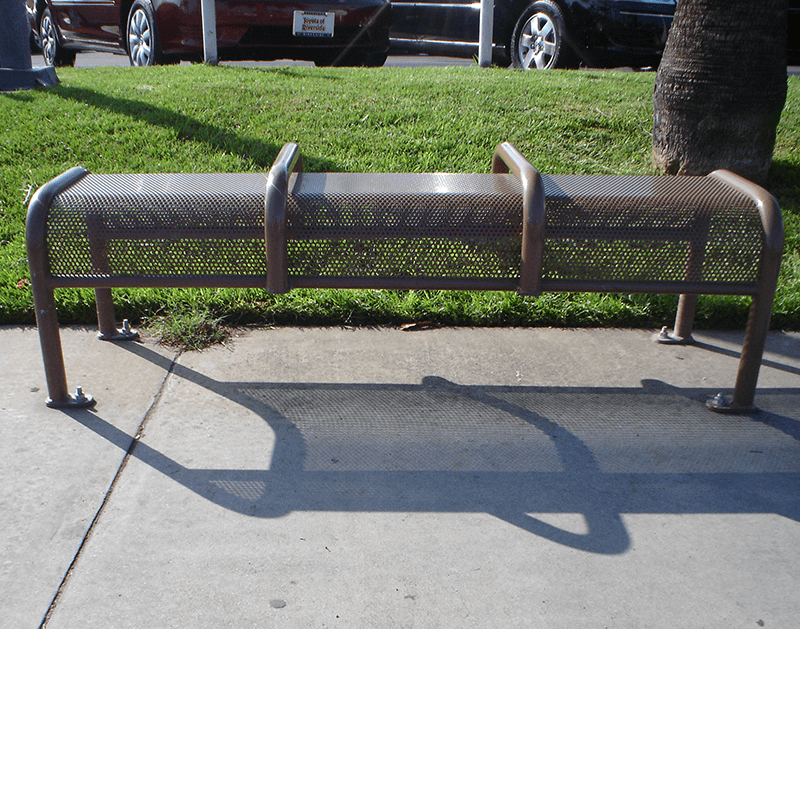 Value for the future. 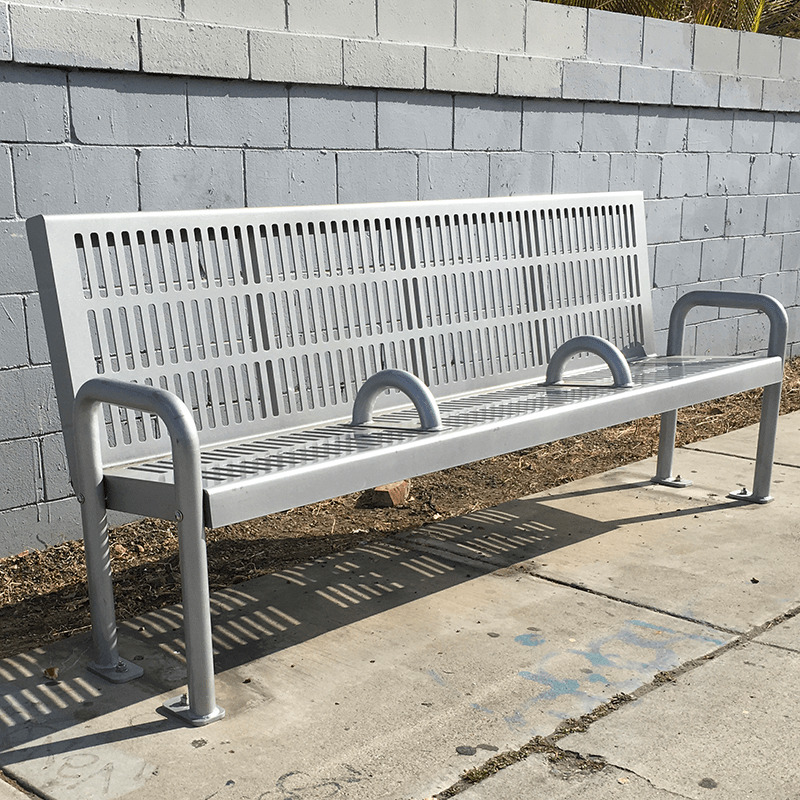 Tolar’s wide-ranging bench choices and modular designs are sure to please your toughest critics while allowing you to plan your streetscape to deliver optimal functionality, longevity and originality. 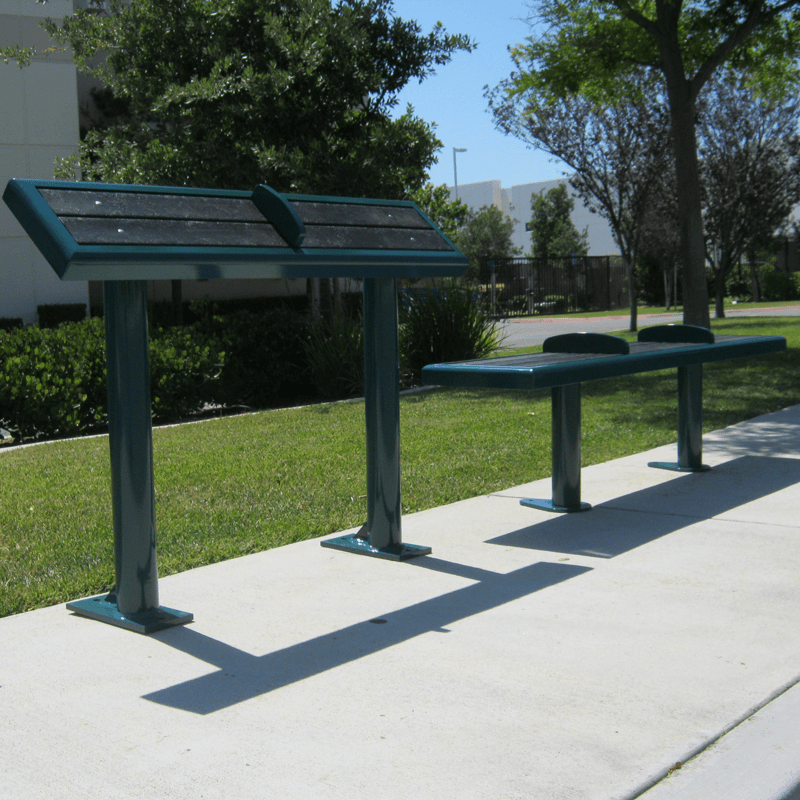 Be sure to pair your benches with matching and customized trash receptacles, bicycle security solutions, transit displays and more – all available from Tolar’s Street Furniture series. 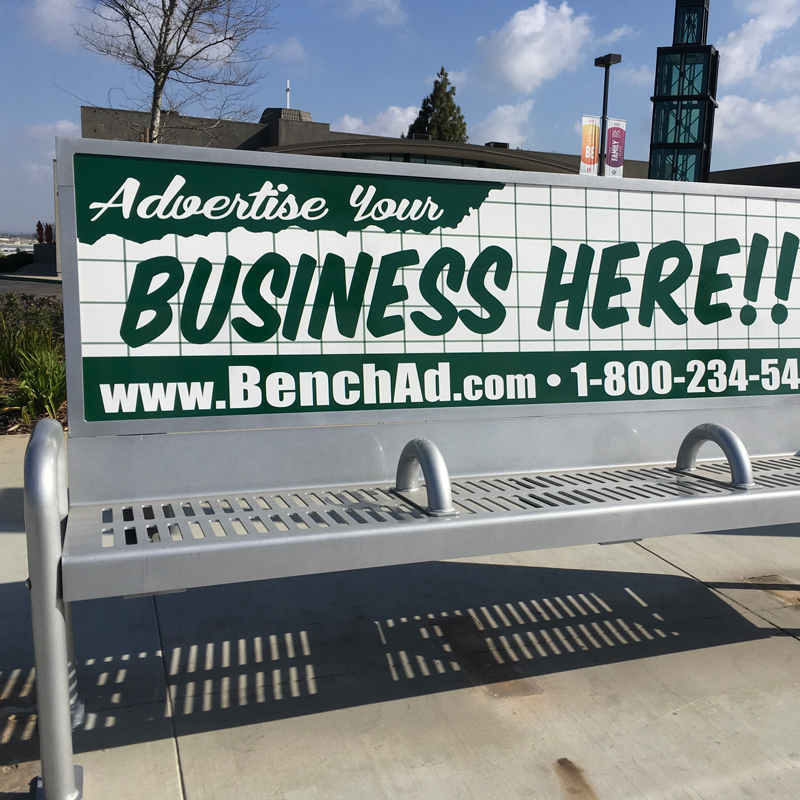 6′ Water Jet Platform Advertising bench with cap ad frame. 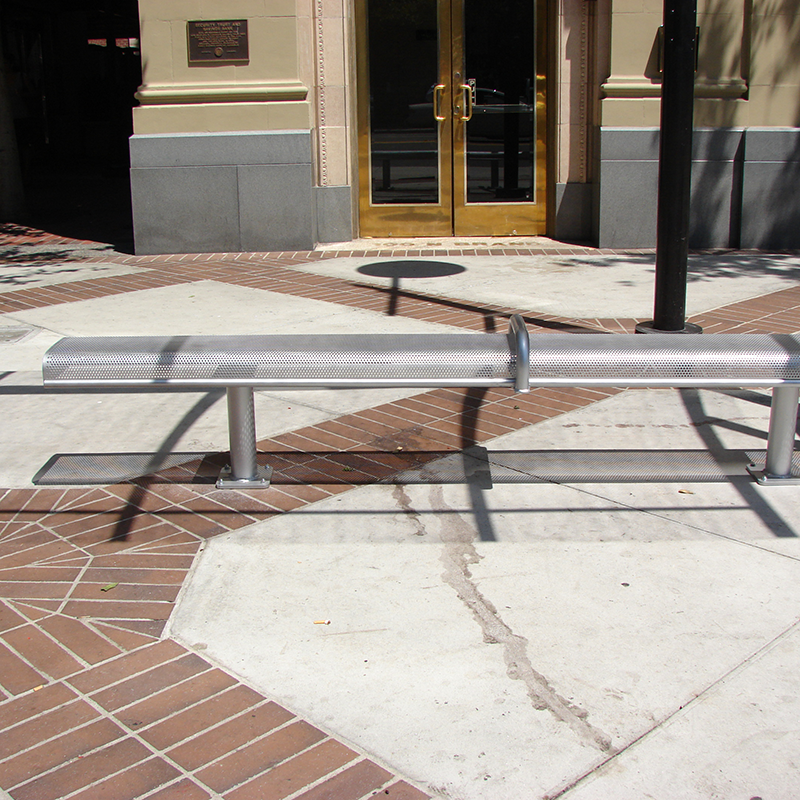 Ships knocked down for ease of shipping. 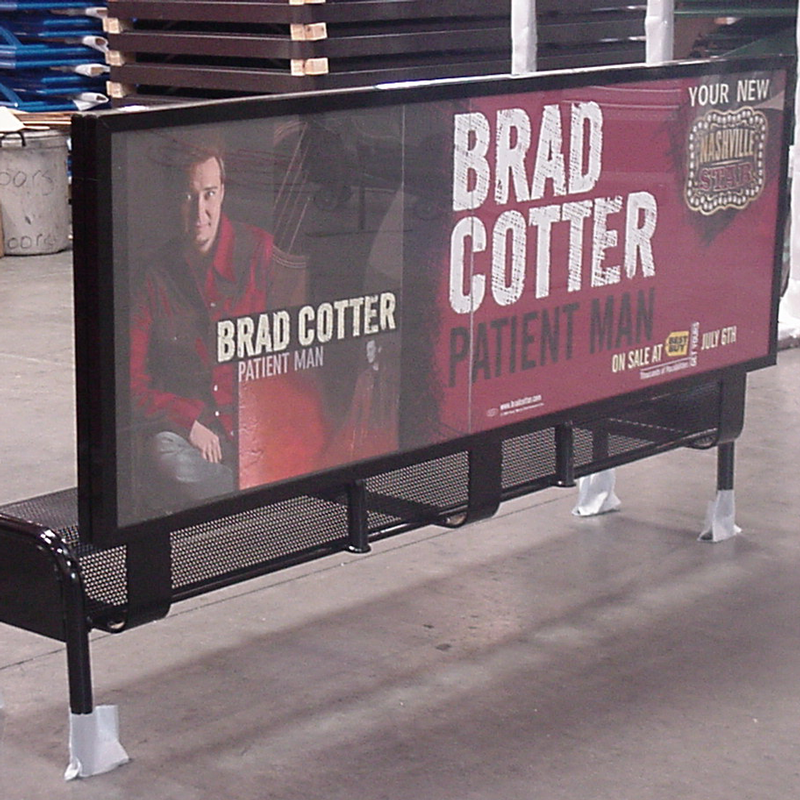 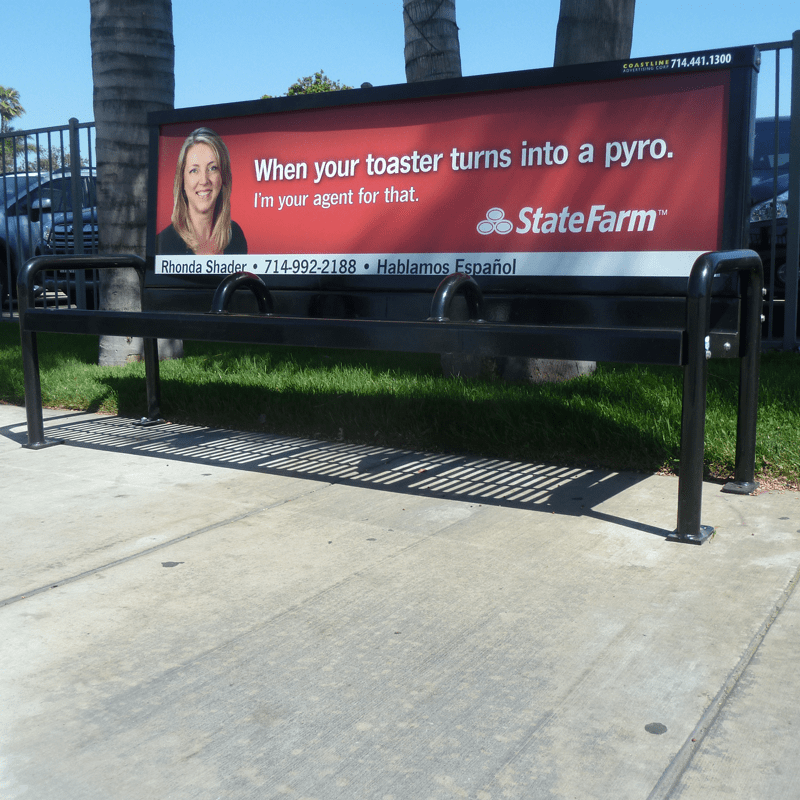 7′ perforated metal advertising bench with tamper resistant ad frame and anti-vagrant bars. 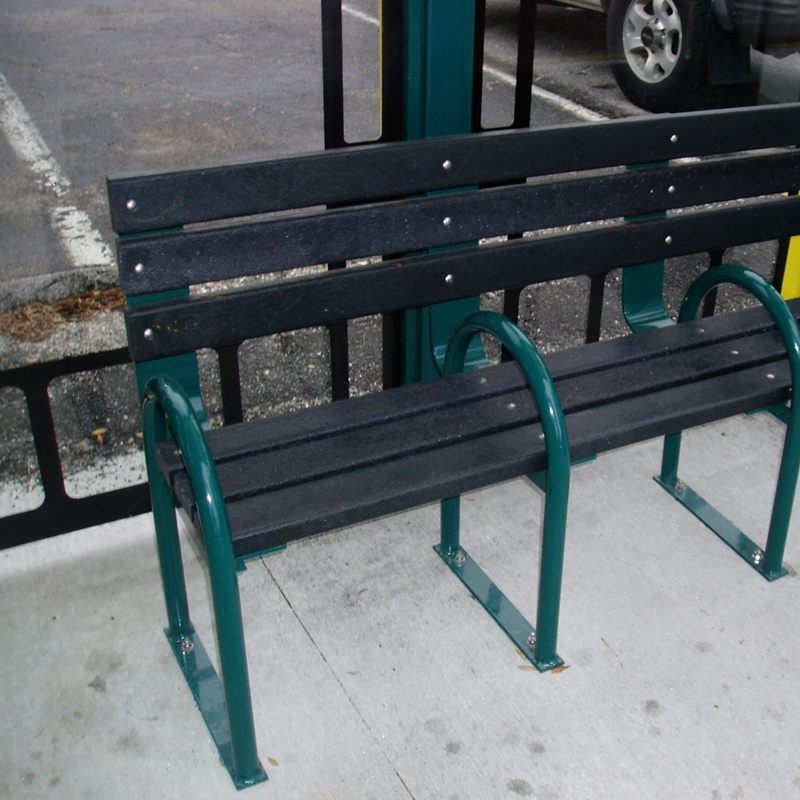 Also available with double back optional 6′ length. 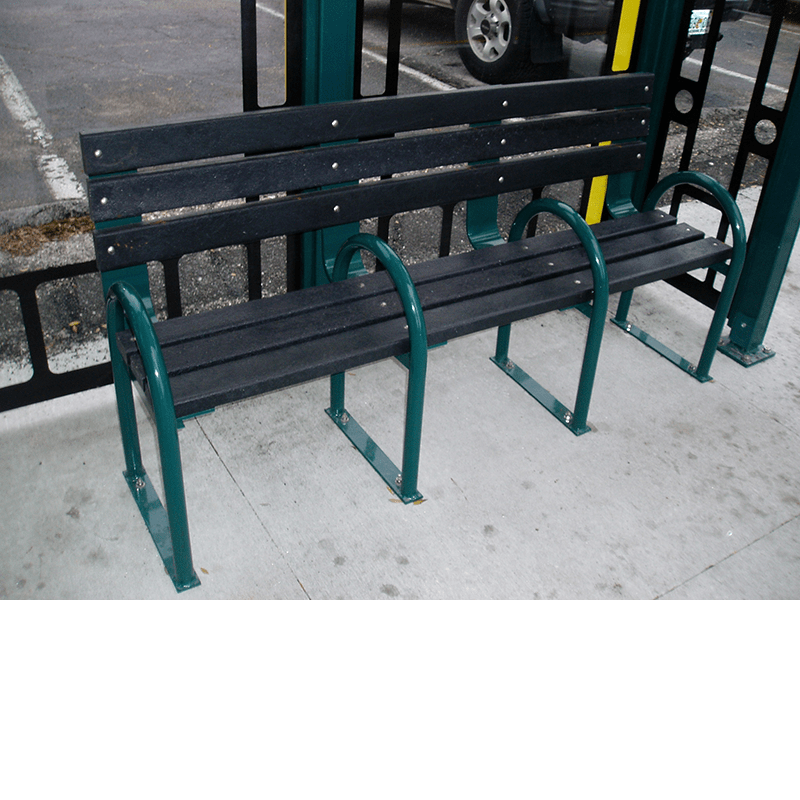 Bus benches with recycled slats and support arms are available in lengths of 4-8 ft. 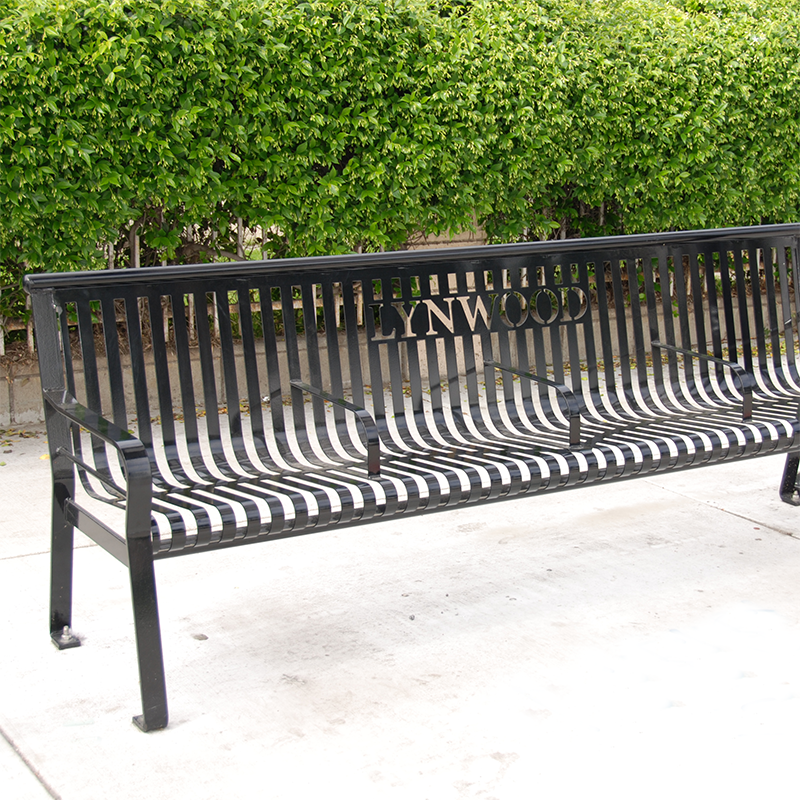 Recycled slat bench with back. 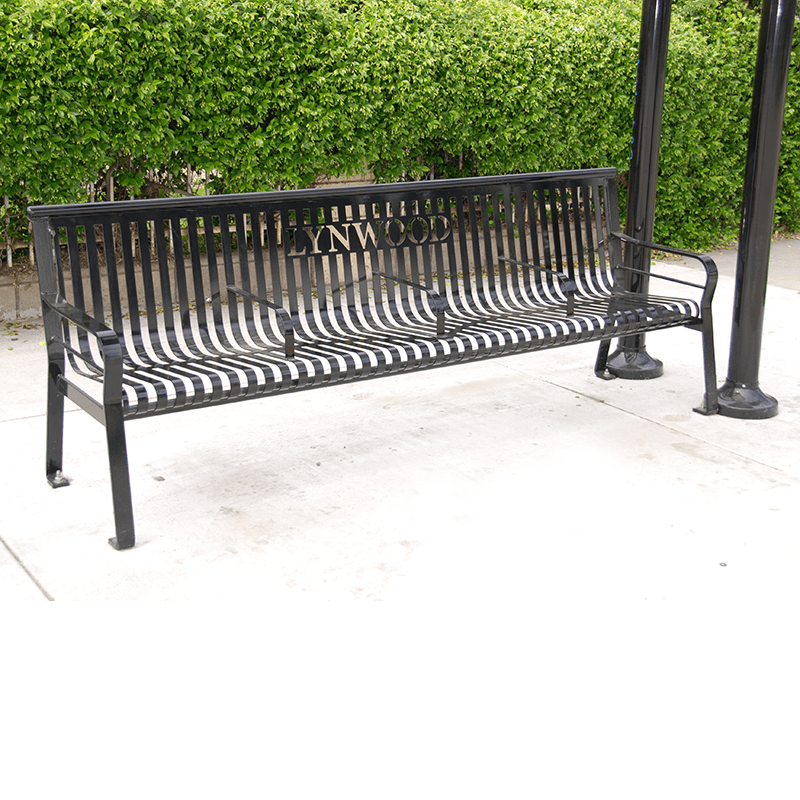 Available in lengths from 4′ to 8′. 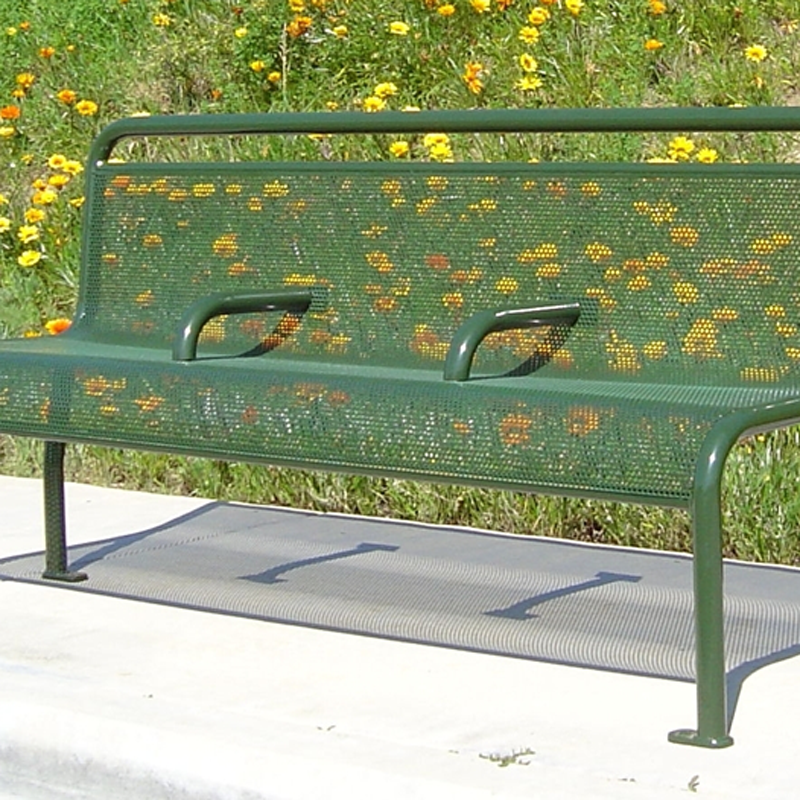 7′ formed perforated metal bench with no back and single anti-vagrant bar. 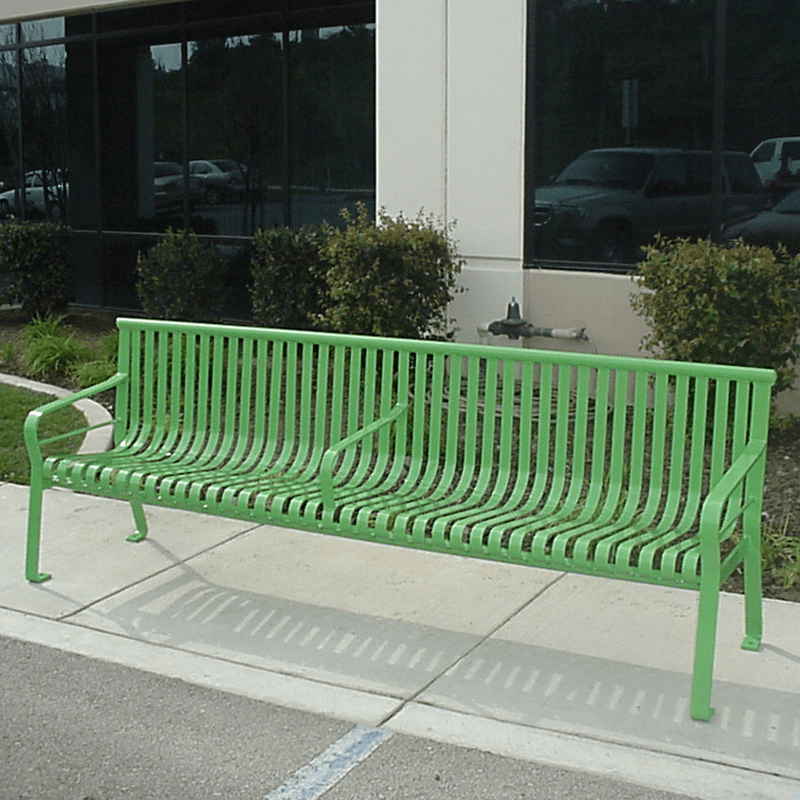 Also available in 10′ length and in an ad bench configuration. 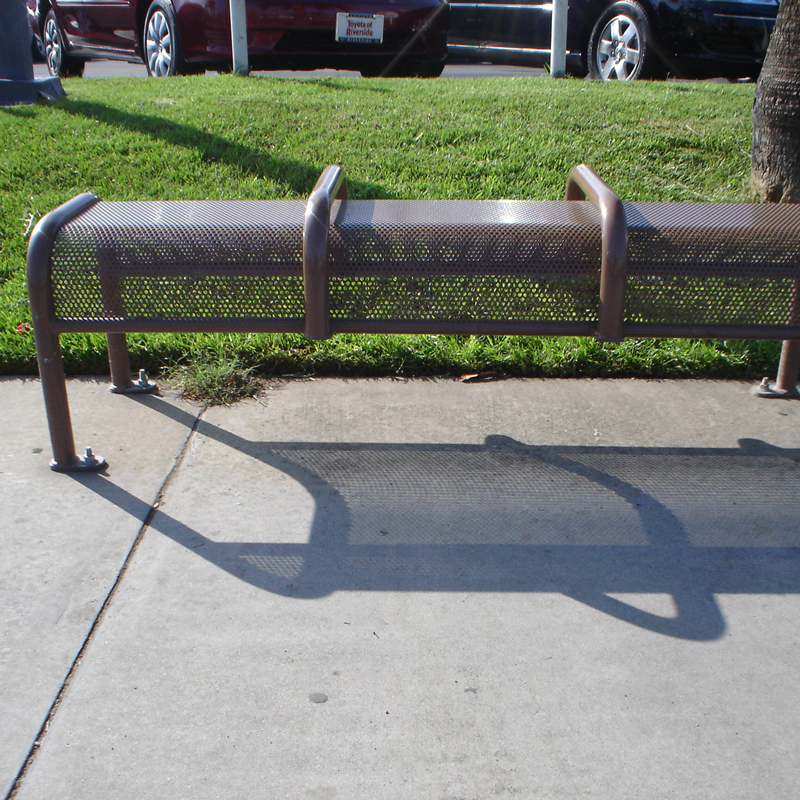 7’ wire grid bench with no back and three anti-vagrant bars. 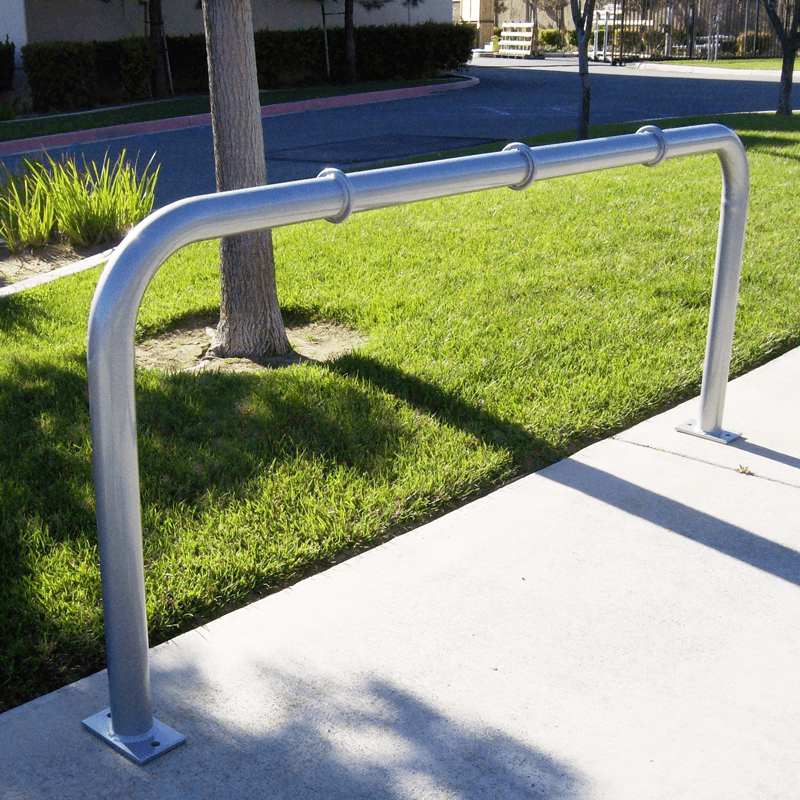 Available in lengths from 3′ to 8′ and without anti-vagrant bars. 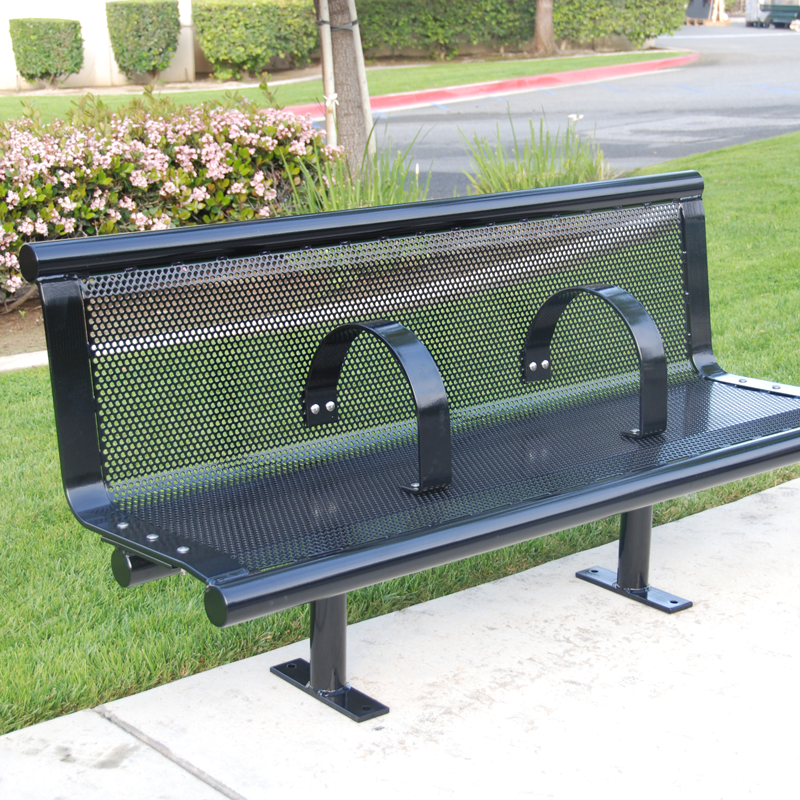 8′ perforated metal bench with no back and enhanced anti-vagrant bars. 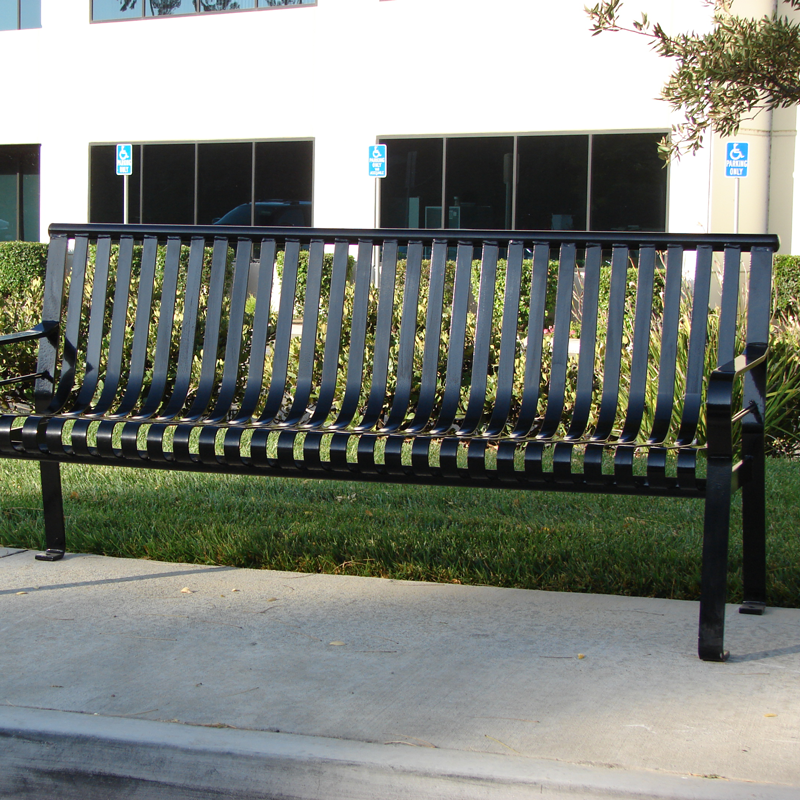 Available in lengths from 4′ to 8′. 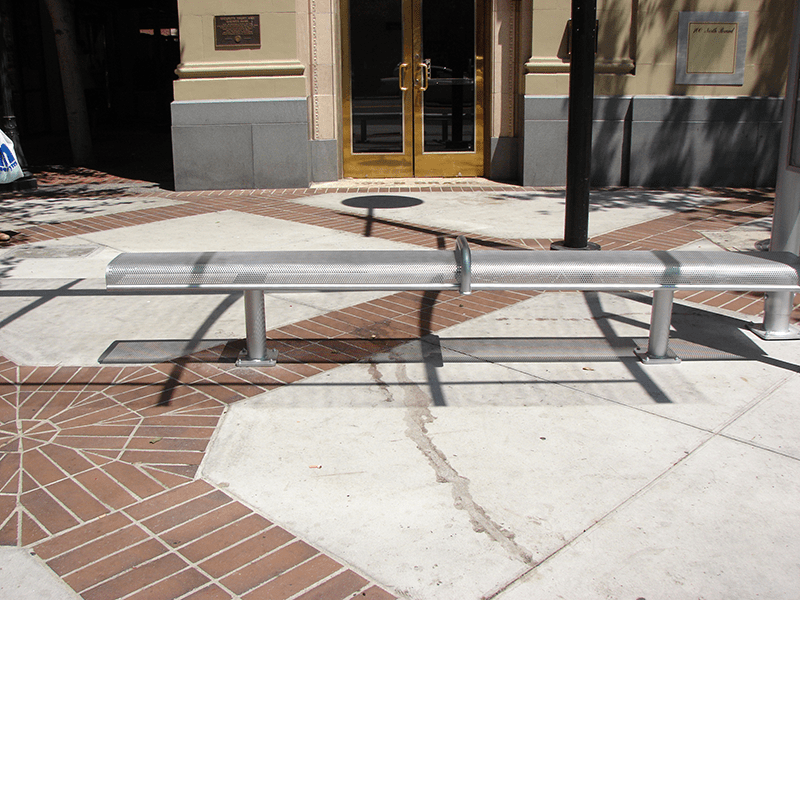 5′ perforated metal bench with no back and two anti-vagrant bars. 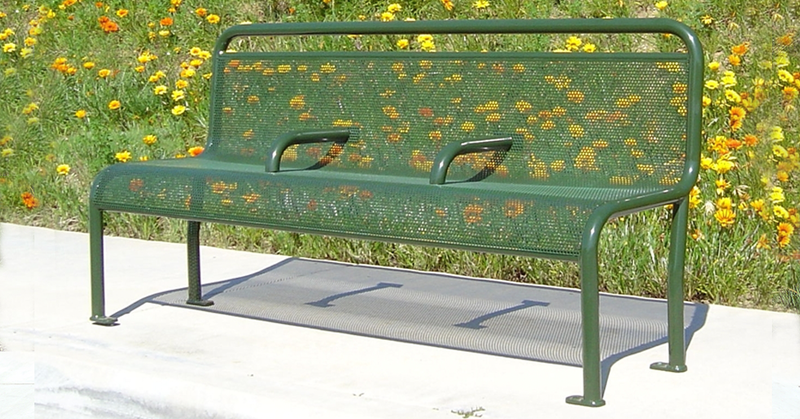 Available in lengths from 3′ to 8′. 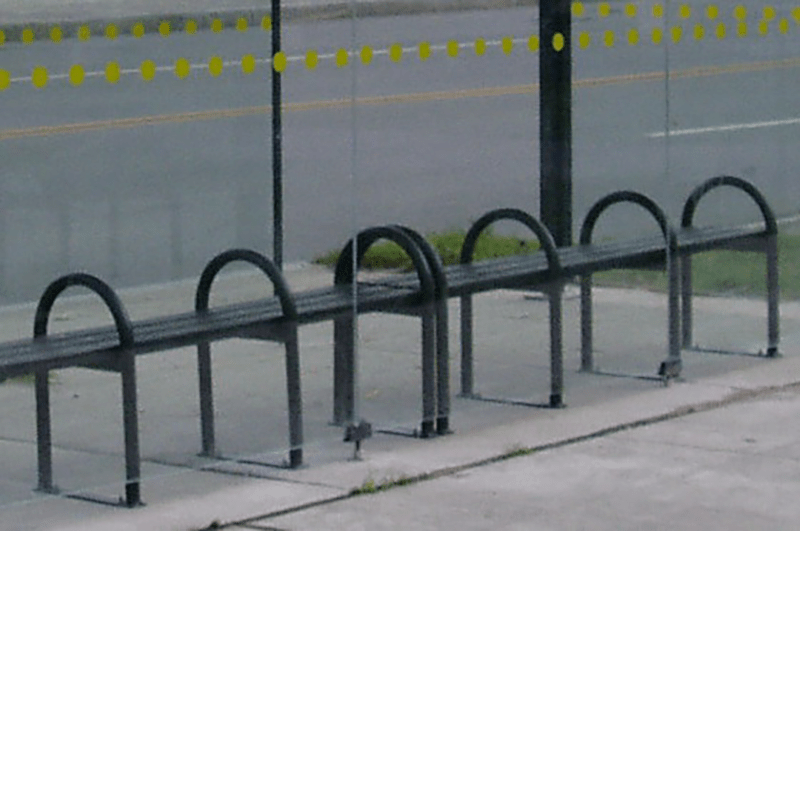 Can also come without anti-vagrant bars. 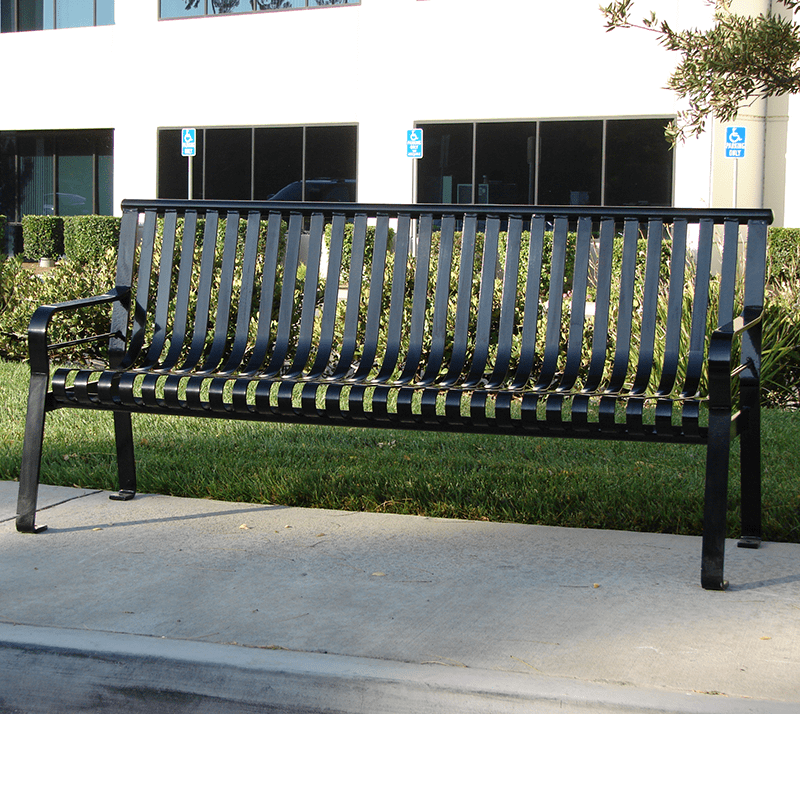 6′ steel strap bench without back. 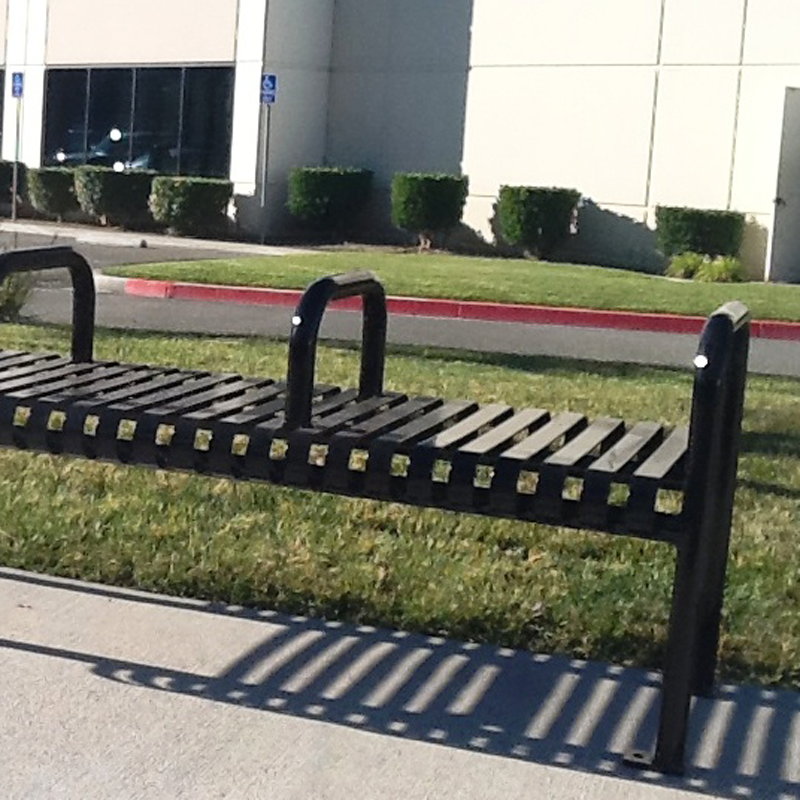 Also available in 4′ and 8′ lengths. 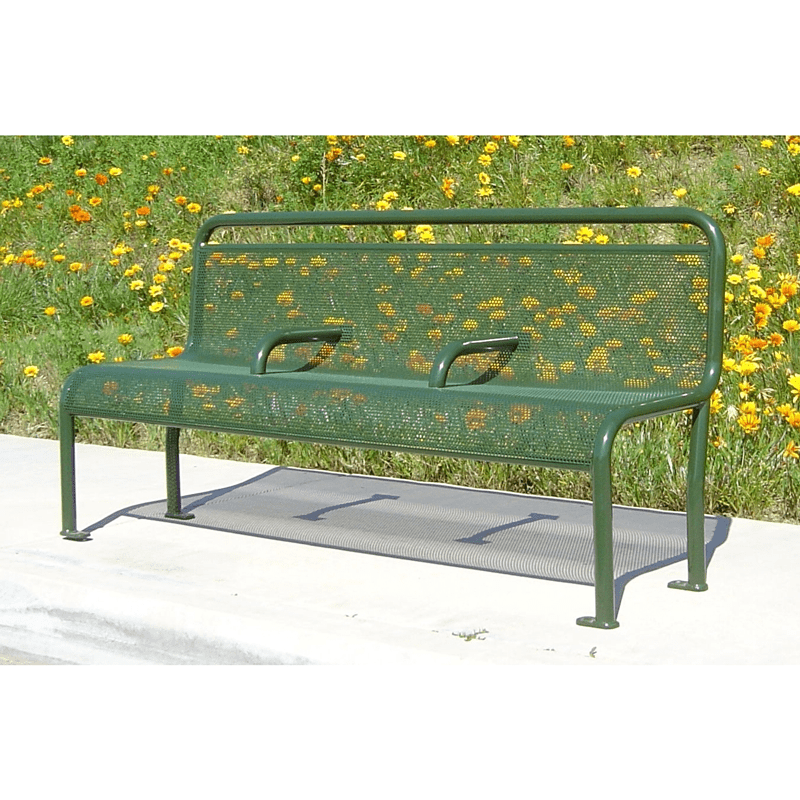 6′ Steel strap bench with no back and three anti-vagrant bars/arm rests. 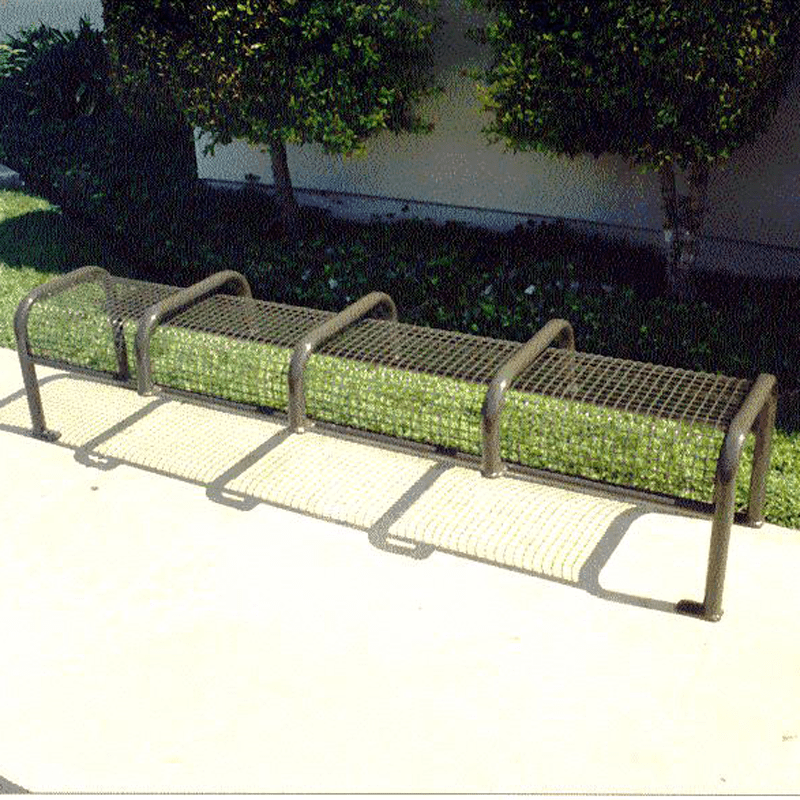 Also available in 4′ and 8′ lengths. 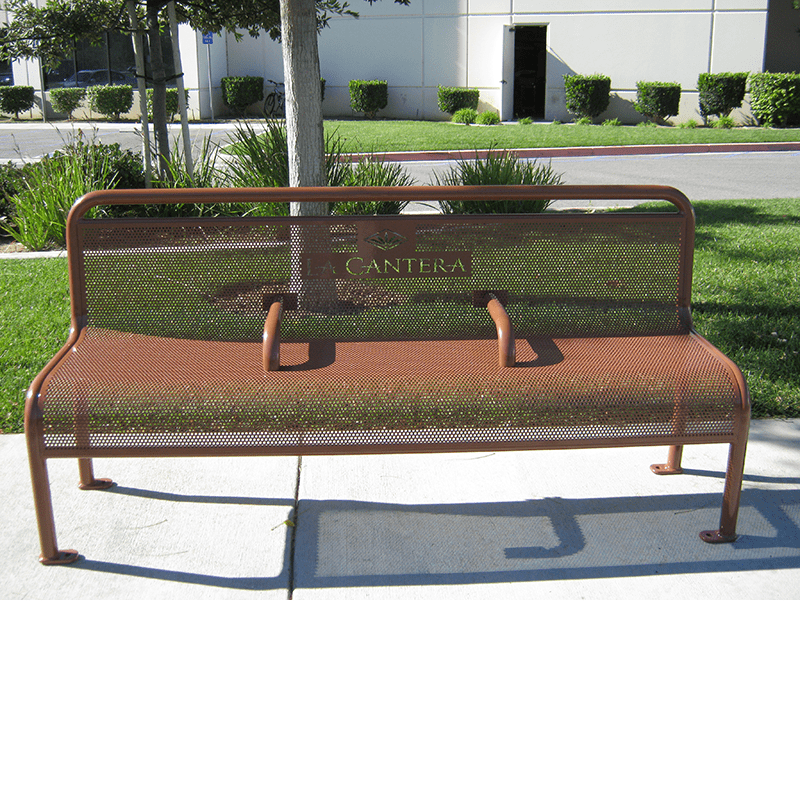 6′ single unit steel strap bench with back. 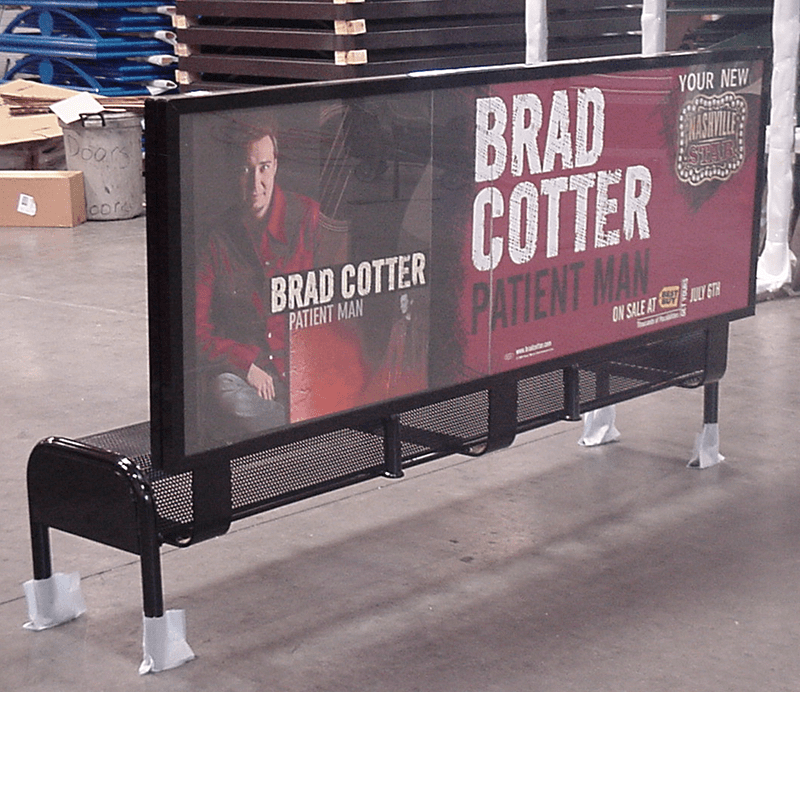 Also available in 4′ and 8′ lengths and with optional bolt-on anti-vagrant bar(s). 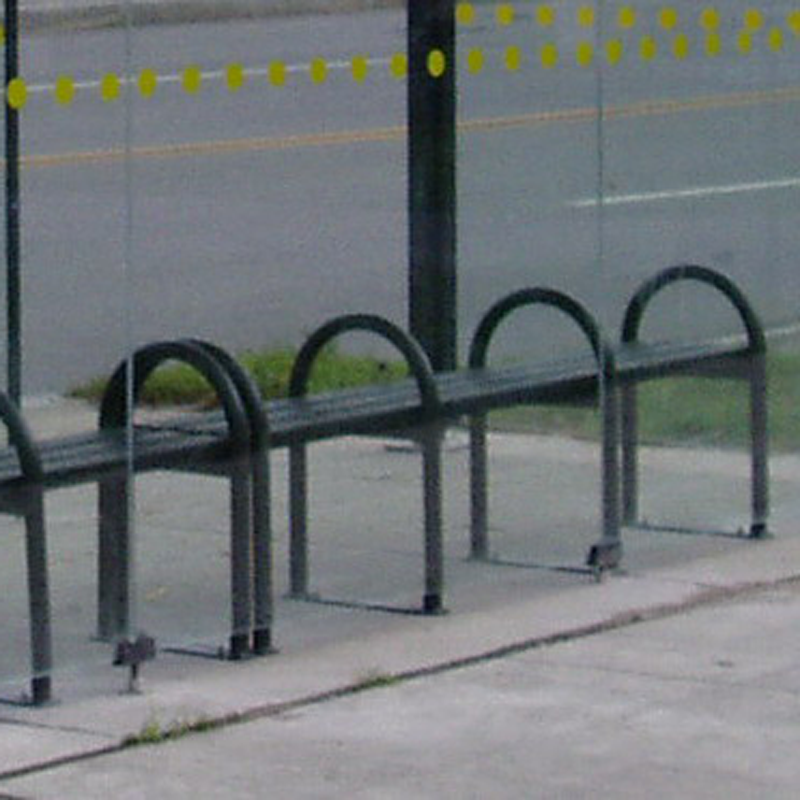 Ships fully assembled. 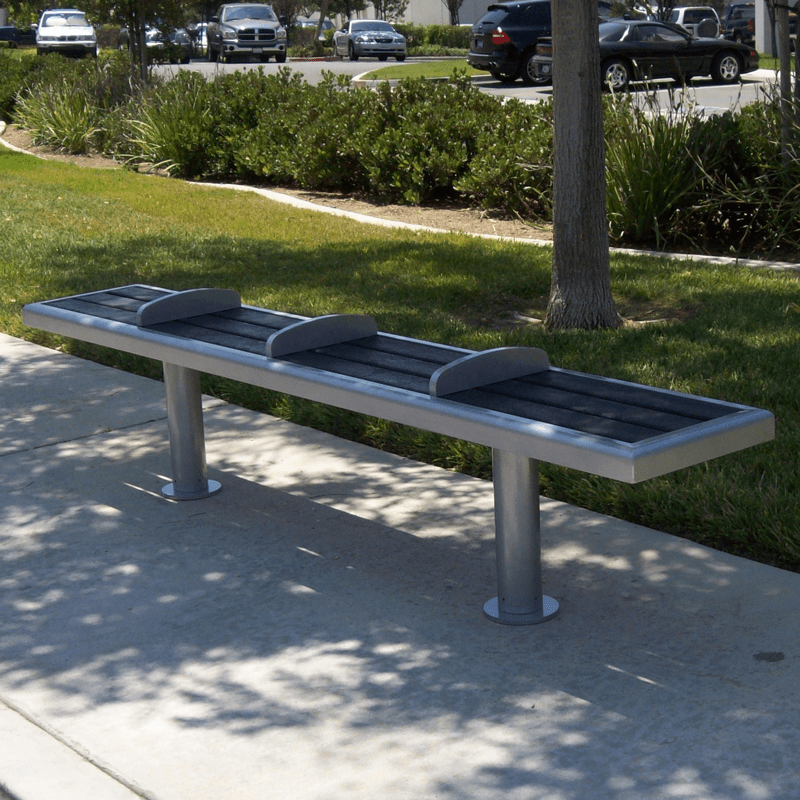 Perch benches are great solutions for providing shelter seating. 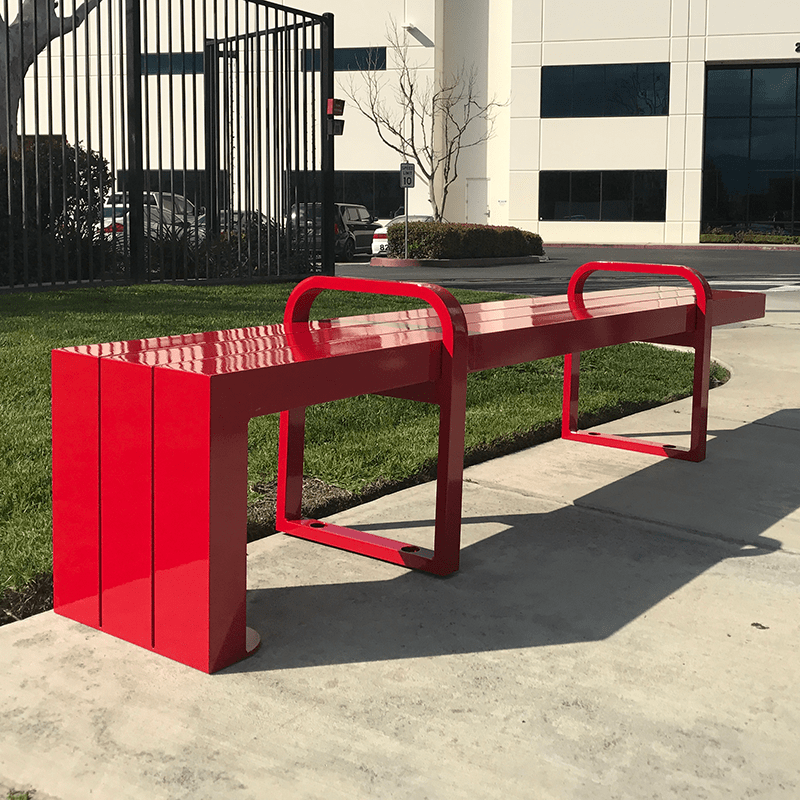 Shown includes an all aluminum frame with supports and recycled co-mingled plastic slats paired with our standard mesa recycle slat bench. 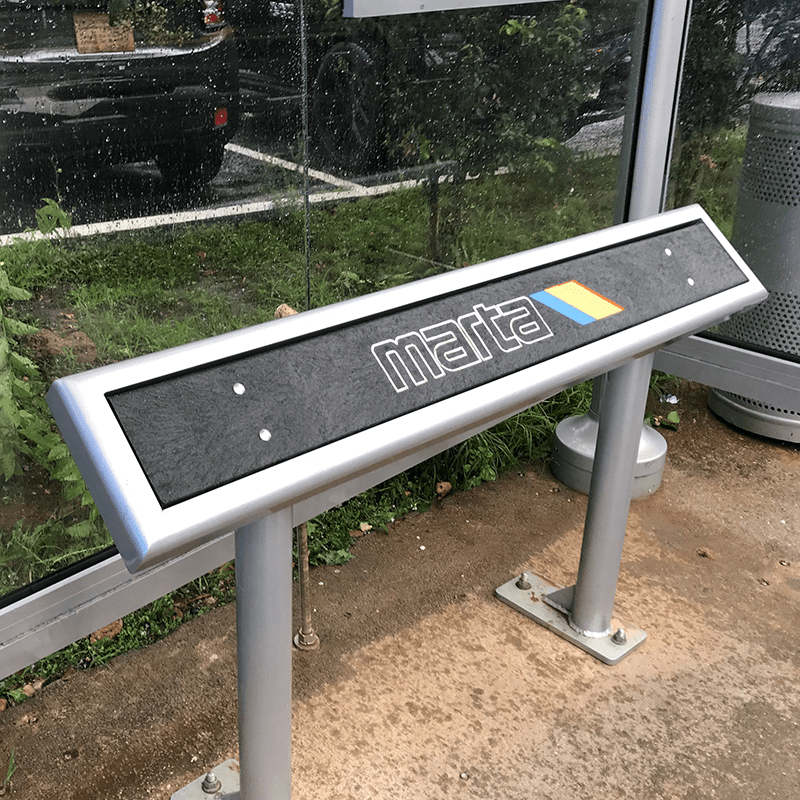 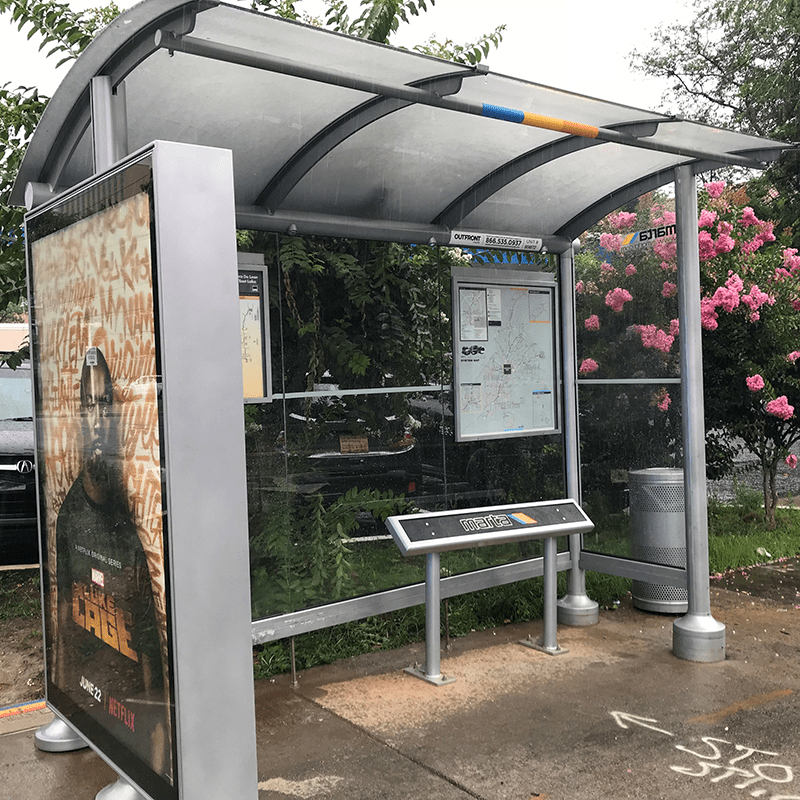 Other MARTA photos show 4-ft Perch bench with agency branding, architectural aluminum frame, aluminum supports and recycled HDPE slat. 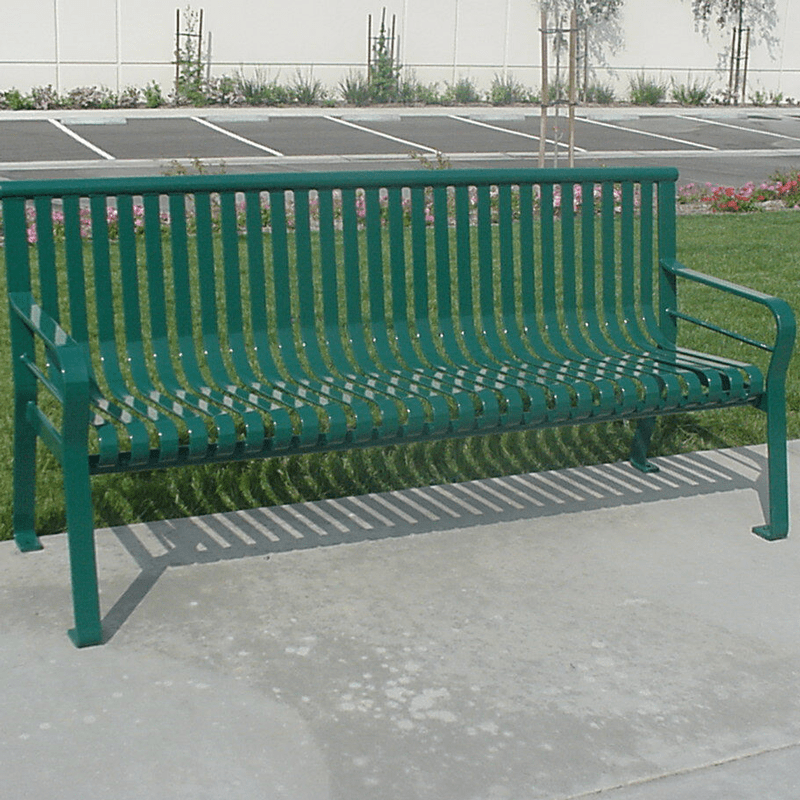 7’ Mesa aluminum frame recycle slat bench, shown with comingled plastic slats. 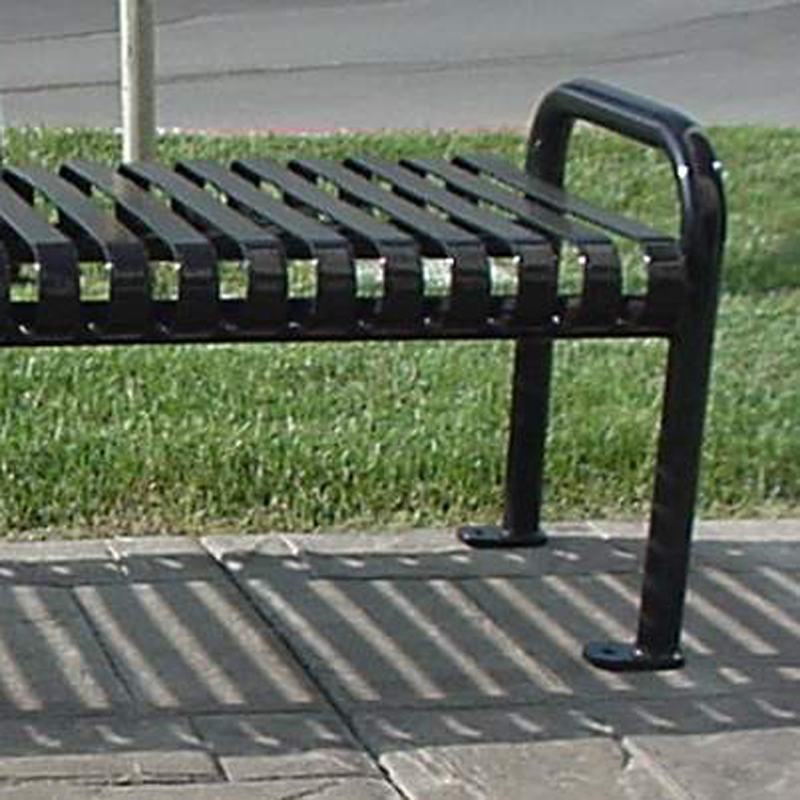 Also available with IPE slats and in lengths from 4’-8’. 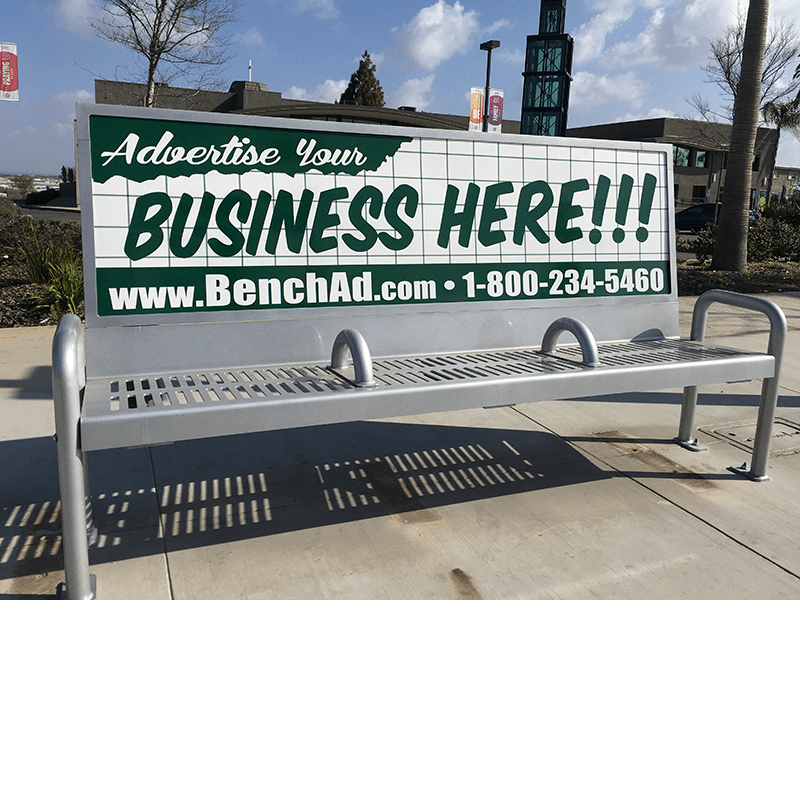 Custom branding options available. 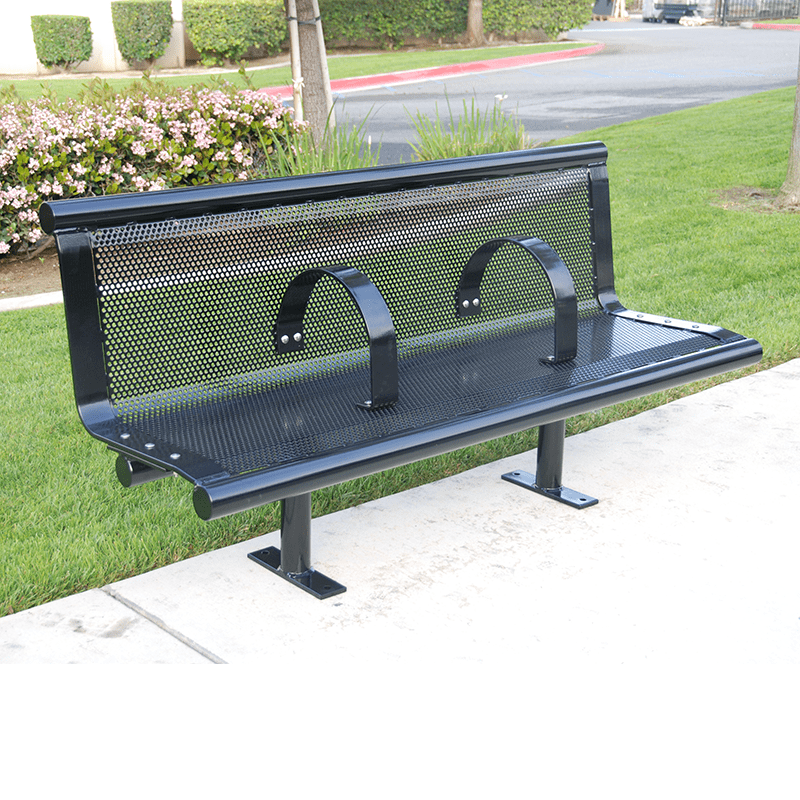 6′ perforated metal bench with back and anti-vagrant bars. 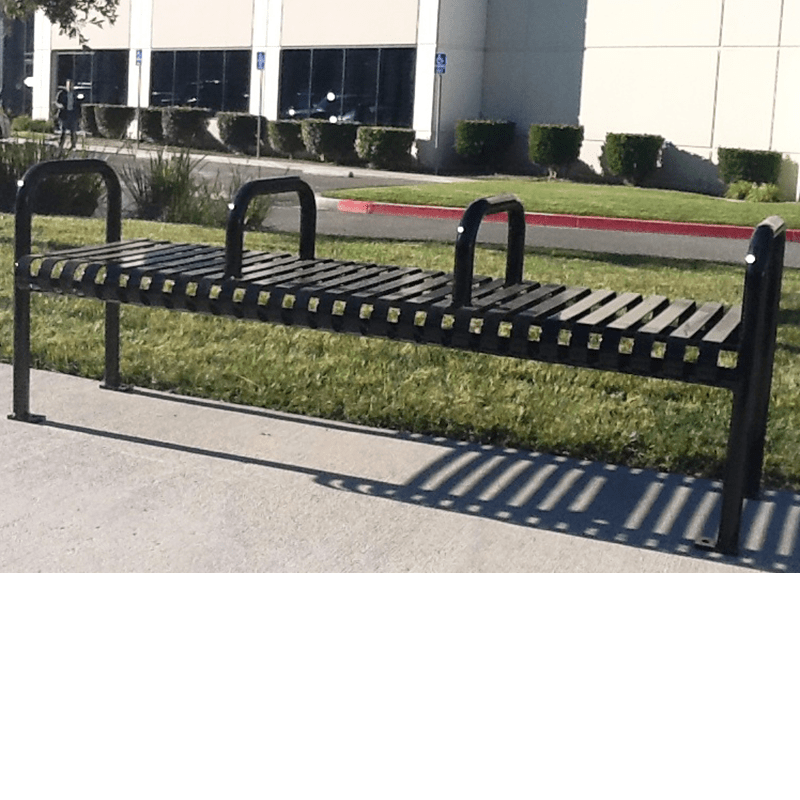 Also available in 4′ and 8′ lengths. 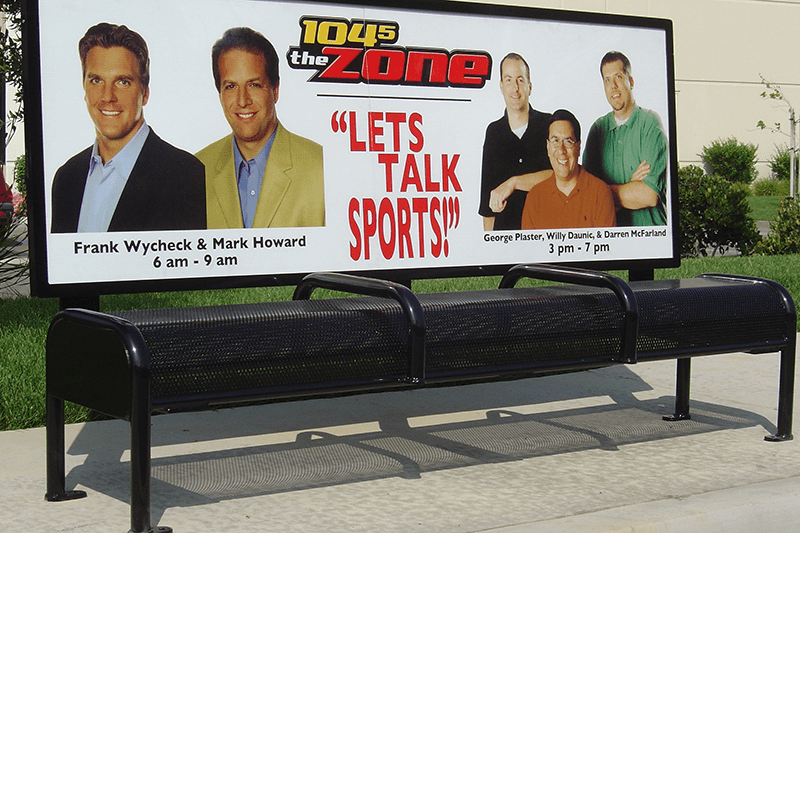 Custom branding options available. 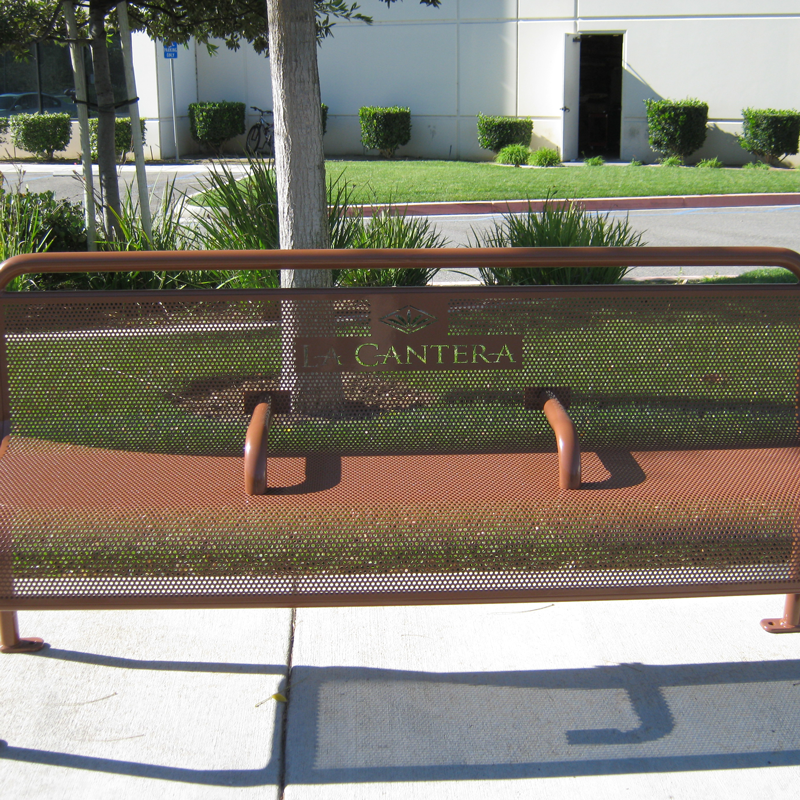 6′ perforated metal bench with custom perforated metal back. 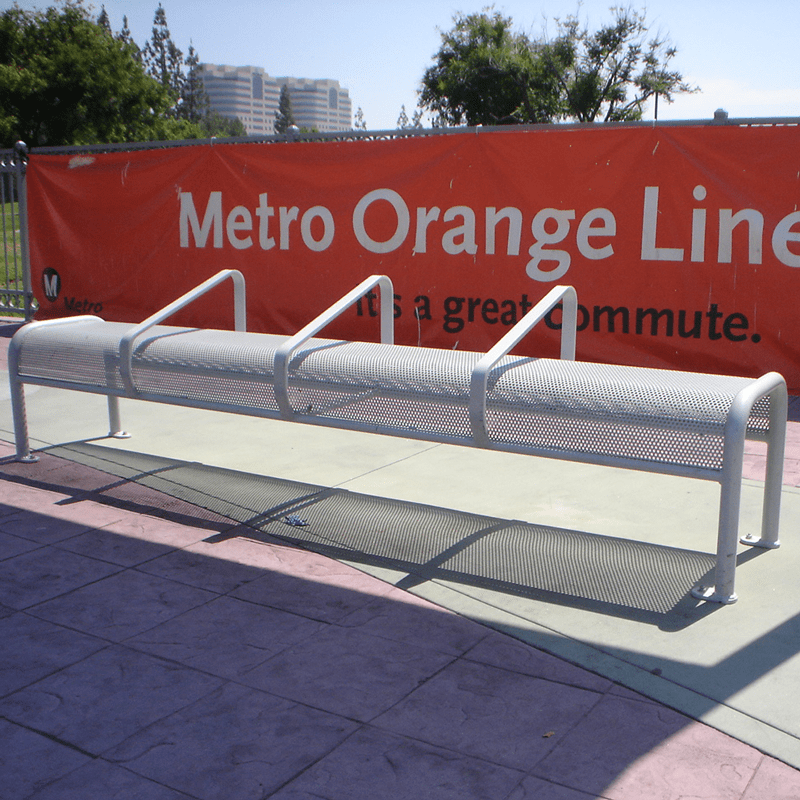 Also available in 4′ and 8′ lengths. 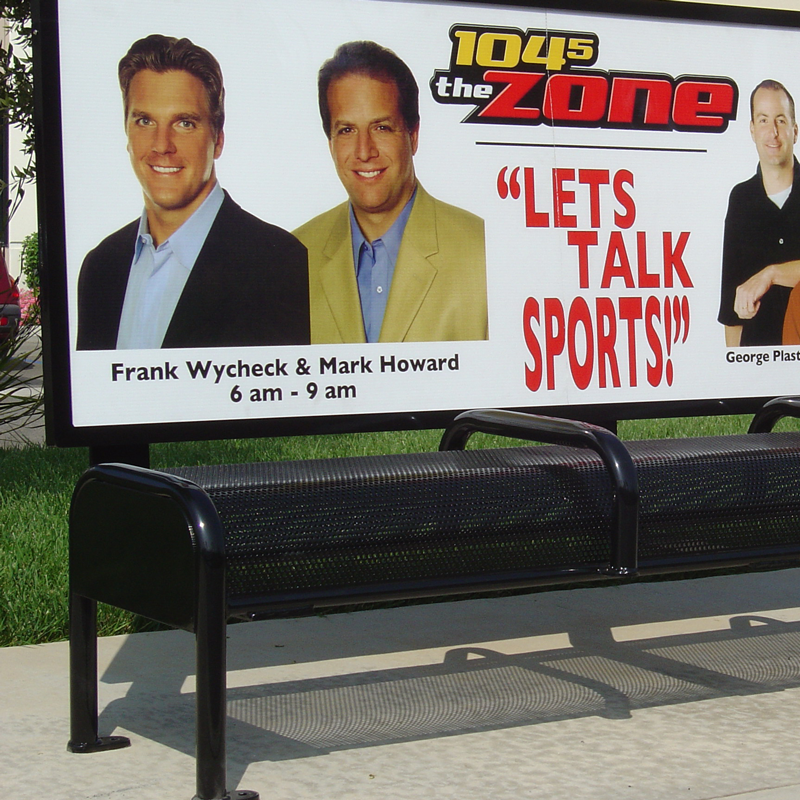 Talk to Team Tolar today about incorporating your logo or brand into any of our designs.